That’s Yefim Gordon and Dmitriy Komissarov on the pioneering jet bomber in their enormously informative Ilyushin IL-28: Famous Russian Aircraft from Crécy – available in North America from Specialty Press. Contents commence with illuminating notes on early Soviet jet bomber development, powerplant and airframe issues, and Il-28 design and deployment details. The Beagle proved exceptionally versatile. 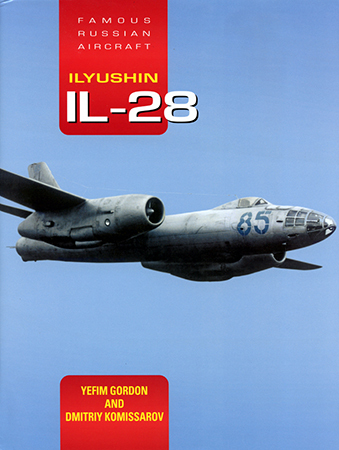 And coverage recaps the whole “Il-28 Family”. Soviet. Chinese. Polish. Czechoslovak. East German. Both Warsaw Pact and export. In addition to principal production versions, derivatives included experimental interceptor, naval and close air support variants – the latter with a whopping 12 external weapons pylons. Mailplane, weather-reconnaissance and target-towing Beagles also numbered among the less militant marks. How about that Vostok spacecraft ejection-seat testbed? Surprises abound. The Il-28 helped refine Soviet design and production techniques in the jet age. So despite “being much larger and having two engines”, authors report, the Beagle proved “actually cheaper than the single-engine MiG-15 and MiG-17 fighters”. Seeking to super-detail your Beagle model? Crécy complies! Close-up shots, interior photos, tech-manual excerpts and scale drawings provide plenty of useful details – especially for hobbyists. The lavishly illustrated effort also sports hundreds of color and B&W photographs. And dozens of profiles survey the scope of Beagle warpaint. How about that spectacular Romanian Il-28 – “Black 310” – in RIAT-2001 “special colours”? Handy tables helpfully recap production numbers, specifications, serials and, where known, individual aircraft fates. And anecdotes even include the pranks ground crew played on each other! Over 1,500 Beagles saw extensive international use. And Il-28s quickly found themselves in Cold War confrontations. Cuba. Taiwan. Hungary. Suez. Vietnam. Nigeria. Even Afghanistan. Authors scrupulously summarize service with “customers in Europe, Asia, Africa and Central America” – my favorite parts. But the US Secretary of Defense during 1962’s Cuban Missile Crisis was Robert McNamara – not Robert Kennedy. And during the Nigerian Civil War, the federal government was not “Islamic”. Let’s cut to the chase: this is the best English-language study of Ilyushin’s legendary Beagle. Crécy’s terrific tome deserves pride-of-place in every Cold War reference library. My sincere thanks to Specialty Press for this review sample!